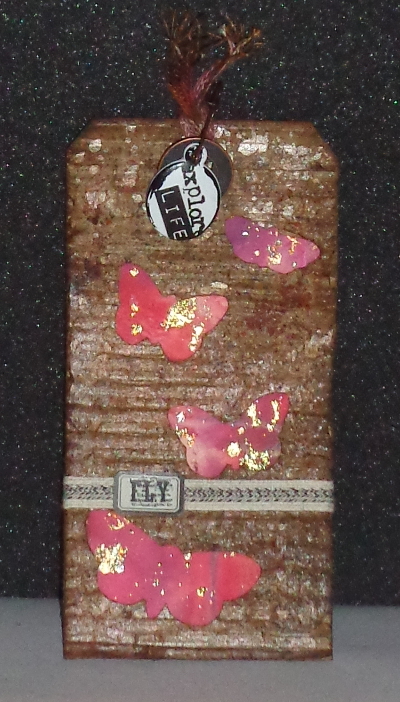 As always Tim Holtz had some great ideas and techniques for this months tag. I love this tag. In case you do not know this already I really love butterflies they are a huge symbol in my life . When I saw the tag I thought it would be so great to play with In fact I ended up with a few extra backgrounds just from what I had on my craft mat. I was aiming for a sort of sunset sky look to my background, I really need to get one of the brighter orange distress paints for my collection. I know cutting it fine yet again…. I have had this almost finished for about a week but was stuck on what I wanted the finishing touches to be. There were so many awesome techniques it was hard to decide what I wanted to do. I used some plastic packaging, the Cracked embossing folder, Peacock feathers distress – ink, paint, stain and marker (I know), silver distress paint, A muse token, the paper twine in striped, rock candy crackle, milled lavender stain and paint, Worn Lipstick (I think) paint, Picked Raspberry Marker, Mini Gears and a wing from that Idea-ology set as well as grungeboard from a basics plain set (the heart and wing), film strip ribbon, and Linen ribbon (I know my how my stash has grown). I also used the Spritzer and my new fav go to must have tool wish I had had one sooner the Tiny Attatcher. It is funny how things that look so simple can be so involved I used the paint and stain technique for the background tag, the embossed plastic, the stained crackle (although mine does not show as much), the outlining with a distress marker though I slightly blended it for the look I wanted). The only technique I have yet to try is the making of my own sand and that is on my list to try at some point I have an idea in mind for it actually. I got a text message the other day, the kind every crafter dreads, you know the one just wondering if you could whip up a card for someone who is leaving. Making my card stash null and void as there needed to be a lot of space to write in. I automatically thought of the Tim Holtz Bird and Cage die as it looks good and is a quick way to take up a fair amount of room. I then inked the bird and it’s wing with some distress ink and set them aside, as you can see I was in such a hurry I did not even change my blending foam and some of the black got mottled into the other colour. I grabbed one of my new hero arts background stamps inked it in one of my fav distress colours Peacock Feathers and spritzed the whole rubber stamp with water. and then blotted off the excess with a tissue. I took I think it was worn paper or antique linen distress ink with my blending tool and covered the whole background with it as I felt the white was a bit to bright it also aged the Peacock feathers a little as well. It took me a few minutes to figure out how I was going to get around the crooked background that did not quite cover the whole card, when my eyes caught sight of my tape container. So out came some Washi Style Tape and I used it around 3 of the edges to cover the crookedness and the blank space. Glued on the bird added on the prima flowers and pearls and viola a card in under 30mins 🙂 I think some days I just get very lucky as a crafter as most of the stuff was pretty close to hand. For about a year or so now I have been totally enchanted by Donna Salazars work with reclaimed denim from her headbands and hand made flowers and embellishments. Recently I found a 50c clothing section in one of my local op shops and scored 3 pairs of jeans. One was so lovely with embroidered pockets when I discovered they would fit a friend I told her they were hers until they fell appart then they were mine lol. It was a bit of a wrench to part with them because there is the most adorable little embroidered pocket on the front. Anyway I have pulled appart and cut up one of the pairs and when I got my New Big Shot this week (thanks to an amazing and generous friend) I did some cutting out of the denim and played a bit with some embossing and Inking. What I have learned is that Denim is a great canvas for ink, it embosses like a dream and is quite a versatile medium. Steel rule dies are the best to cut through the fabric however as long as you do not mind having to do a little cutting, the thin metal dies work pretty well. I decorated the pocket to match the Album cover with an M-Press Heart that had been embossed with a Cuttlebug Script folder. The album is cut from the Quickutz Santa’s Workshop Die Set, I used part of the elastic stretch section of the Jeans as a sort of Handle, all the pages are embossed with an M Press Butterflies embossing folder and then inked over. and thats it one Denim Mini Album stored in a Denim Pocket. I may end up cutting out a word from Denim and adding it to the pocket just to tie it all together a little better. By now you are all well and truly aware I am not only a budget scrapper but a bargain hunter as well. Nearly all my craft supplies have been gotten on Sale, or at a discounted rate. I recycle everything I can think of. Anyway the OP shop (opportunity or second hand shop for non Aussies) near my Councilor is a treasure trove of interesting items. and this little Locker which once upon a time came with a Mary Kate or Ashley Olsen Doll for 50c. It still had the faux magazines and books inside it. This is just phase one of this project I have an idea for it but it will take some $$$ to get the things I want and a little inventiveness on my part. Now because I like to pin my posts and I am not clever enough with photo editing to put the pics all Into one I will start with what I have done to it then show you what it looked like to begin with etc. Almost backwards but not quite. and here is is covered in Foil Tape (I got a rather large 2″ wide roll from ebay by searching foil tape worldwide it was about $4 and it is well worth the money as it goes very far.) I was tempted to leave it like this cause its kind of fun and funky all silver but I really do have an idea for where I want to take it. and again how it looks now. I embossed the foil tape by tearing it into strips the length of my Cuttlebug embossing folder. I embossed about 4 strips at a time as they are thin and it is much quicker this way. I also did the strips in different sections of the folder so I could mix up the looks. I then took each strip and used alcohol inks in Lettuce, rust and another colour. Painted it with Black Ranger Paint dabber, left it to dry overnight and then lightly sanded off some of the black paint. I find the steel wool technique does not seem to work very well for me and flattens the embossing a bit to much for my liking. The best part about the foil tape is that it is very forgiving and easy to add more where needed. This matchbox had been sitting partially finished in my stash since last year. Ever have that thing where you start something, it doesn’t fit the swap or person it’s intended for and you kind of loose the flow of what you are doing so it sits around waiting for you to discover how to finish it? I had created the matchbox and wee book prior to knowing who my swap partner was (look back to the faux grimoire matchbox to see what I did for the swap) and of course it was completely unsuitable for that person. So here it is (I am so pleased with how this turned out I just love the butterfly garden papers by Pink Paisley hard to get now but so glad I have them in my stash. This is an ordinary matchbox I recycled. and that’s it there isn’t any more. An idea popped into my head last night and would not leave. Based on my very first blog tutorial here. Variagated recycled book flowers. So being me and it being almost the 11th hour I had to try this with the tattered florals. I had an ornament I never quite knew how I wanted to finish that I had experimented with clear gallery glass and pearl ex powder on the inside of. I added some white paper twine around the top with some magic tape and a loop to hang the ornament. Then used some glue dots to adhere the handmade scrunched tattered floral flowers around the outside of the glass bauble.